A company based in Vancouver are using 3D printing in order to recreate famous paintings so everyone can enjoy the meticulous craftwork of their favourite artist. Next2future has also create and build up the expertise to blend modern technology with historical art in order to recreate priceless canvases and oil paintings. The way in which this can be done is through 3D scanning and 3D printing processes which create a final replica product that, unlike the original, can be touched. This use of 3D printing is to create a new form of art education through use of the meticulous and latest 3D scanning and 3D printing technology processes. It will take few hours of extensive scanning of an original piece in order to gather enough 3D data to reproduce a work of art. The same is possible through high resolution photographs too. 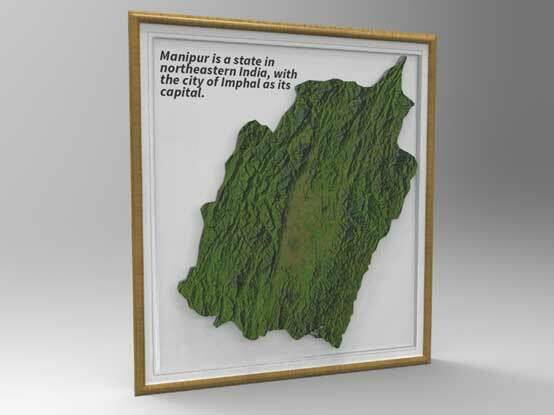 We have made a Topography map of Manipur terrain.